A self-loading pistol without a magazine is at best an awkward single-shot firearm. And some aren't even single-shots. If your pistol has a magazine disconnector in it, without a magazine you have an awkward club. So it behooves you to buy good-quality magazines, treat them right and keep track of them. Let's start with new mags. The old adage "If it seems too good to be true, it is" applies in spades with magazines. If they normally cost (fill in the blank) and someone is offering them to you for less than half that, be suspicious. Once you've bought some, you want to make sure they work properly. First, take each apart one at a time. Look at the follower for chips, dings, tool marks or gouges. You need to smooth out any such imperfections you find. Check the spring. Is it clean and of the proper length? (If it isn't do not stretch it.) It helps to have a properly functioning magazine of the same brand when doing these inspections. Was the spring in properly? If not, make sure it is when you reassemble. Put it back together and dry-check it. Does it insert smoothly and drop free of its own weight when you press the mag button? Does it lock the slide open? Does the baseplate stay on in normal handling and function? A "no" answer at any point is a bad sign. Blemishes such as the polymer delaminating from this magazine don't interfere with function, so don't worry about them. Load it up. Does it hold as many rounds as it is supposed to? Do the cartridges strip off easily with thumb pressure? Once your magazines pass those inspections, we get on to the only one that really counts: test-firing. Pistol magazines, if they are prone to malfunctions, will usually fail in the first two or three rounds or the last two or three rounds. Load your magazines with three rounds and test-fire them. Do this for 10 checks or so per magazine. (Yes, this can get expensive in ammo, but you want reliable magazines, right?) Once they all pass, load them fully and then fire only the top two or three. Once they've all passed, strip the cartridges out until there are two or three rounds left, and then fire them as limp-wristed as possible. The magazines must feed and lock open regardless of how lightly you hold the pistol. Once they pass all the tests, you can introduce them to the rest of the magazines in your inventory. Got bad mags? Dispose of them or mark them, but don't let them get mixed in with your good magazines. What if they don't? Send them back or send them to a magazine tuner like Grams Engineering. In some cases you may find that the tubes are good but the internals are not so good (common in some high-capacity pistols), in which case you can order internal parts from Grams Engineering ( gramsengineering.com ) or Dawson Precision ( dawsonprecision. com ). I have four magazines I took to a previous World Shoot when I was competing in Modified Division. Typical "short" STI mags hold only 16 rounds. Once tuned, they reliably held and fed 17 rounds each. Of course, any extra work adds cost. The parts and tuning of the magazines cost me as much as the mags themselves did. But at the International level, an extra round per magazine can be very comforting. If you buy from reputable sources and don't try home fixes, you can be sure any problems will be resolved quickly—just be sure to test any mags that were replaced or repaired. Once you've assured yourself that you have all the dependable, working magazines you need or want, how do you keep them in tip-top shape? There are a few issues we should get out of the way first. The first one, a biggie, is that springs do not take a set in a loaded magazine. Magazines are simple: a coil spring in a tube, lifting a platform that pushes the cartridges. Kept loaded (and assuming it is a good magazine) that spring does not lose strength. A widow of a gunnery sergeant once brought in some magazines to the gun shop where I worked. While I don't know how long before his death the gunny had loaded those magazines, I do know the widow hadn't touched them in the 17 years since his passing. All the magazines worked just fine. The moral? If you buy good-quality magazines, yours will work as well no matter how long you leave them loaded. So don't sweat leaving magazines loaded. 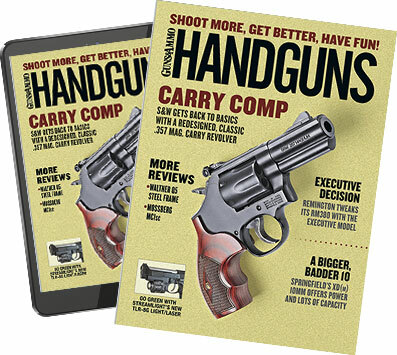 Now that we've answered that question, there are a few things you must do to ensure your magazines won't fail you in a shooting session, a big match or, God forbid, a defensive situation. Lubing up the follower isn't going to make it do its job any better and will simply attract the grit and junk I mentioned before. That stuff will gum up the follower-to-tube fit and cause the very malfunction you were trying to avoid. I wince every time I see someone spraying oil into a magazine tube. Don't stretch your springs. Some people like to pull the springs out and stretch them to "restore" their strength. Like applying oil, this practice is counterproductive. Springs work for a long time--as long as the amount of bend you impart to the steel stays inside the designed tension limits of the part. Basically, if you compress or stretch it only within the limits it was designed for, it will last a long time. Bend it past its limit and it takes a more-or-less permanent set. Which is what you're doing if you stretch that spring. You're overworking it and reducing its strength and service life. Stretched springs "die" faster. To no great surprise except those doing it, the guys you see stretching springs seem to always have to do it to keep their magazines running. Just ask them; they'll tell you their tales of woe in keeping magazines running. Leave the lips alone. Yes, there are special magazine tuners like Beven Gram who will adjust magazine lips. High-volume competition shooters will sometimes measure, record, check and adjust magazine lips. However, you only get a few tries at bending each tube to get it right. The pro tuners have experimented on other magazines long before they adjust yours. Once you've had a pro work on your mags (if they really needed it), you should leave them alone. Know the proper way to take your magazines apart, and do it one at a time. Keep all the parts together, and don't mix and match tubes, springs, followers, etc. If you want to go down the path the serious competitors do, realize this: tubes are spring steel. Overwork them and they work-harden, fatigue and quit on you. Once you start down the path of mag-lip tuning, you will be embarking on an ever-increasing struggle until the magazine finally quits on you and becomes unusable. All drops are not equal. Yes, your magazines are going to hit the ground, but you want to not to drop them in such a way that they'll be damaged. Concrete is bad. Ditto asphalt, coarse gravel, river rocks and landscaping boulders. Those cute little rubber pads you put on your magazine bases are there only for fast reloads; they do nothing to limit damage. And, besides, who cares about the baseplate--it's the lips that matter. And they don't have a cover. If your magazine falls on the lips and becomes damaged, you have three choices: Buy a new one, send it to a pro tuner or experiment on it yourself. Just be aware that if you take door number three, there are no guarantees. Have fun, learn all you can, but don't expect that a few minutes with a pair of smooth-jawed pliers will salvage your magazine investment. Sand and mud are your enemies. The two things keep magazines from running are sand and mud. I have been on plenty of firing ranges that had each and some that had both. In fact, if you shoot regularly you're sure to face one or the other. Sand is simple: Knock and blow as much of the sand out as you can, and then use a mag brush to brush the rest clean. You can get brushes from Arredondo Accessories (<a href="// arredondoaccessories.com ) or from Kleen-Bore (kleen-bore.com). If you want to, you can take the baseplate off and then brush it out. Wipe the sand off the follower. Put it back together and get on with shooting. No secret lubricant, no space-age coating that shrugs off dust or sand and (repeat after me) no oil. What if you've picked up your magazine and it is gooey or runny with mud. What to do? First, unload it. Not because muddy ammo is a problem but because it makes the next step easier. Find a clean puddle and swish the magazine around. Work the follower and swish some more. If there is no clean water in puddles, then either use the cleanest puddle or rinse it off with water from your drinking bottle. Work the follower up and down a bit to feel for grit, then load and get back to work. If it makes you feel good, disassemble the magazine and then swish it in water. Stop cringing. Water washes away mud. Magazines are a key component to a well-running pistol, but unfortunately they get subjected to a lot of use and abuse. Know what to sweat and what not to. Guard them with your life. Okay, so that's an overstatement, but there is another route to ending up with bad magazines, and that is to lose yours in the jumble with other shooters. At the law enforcement classes I teach, we can have 20 to 40 officers on the line at once, and a drill or qualification string that requires multiple magazines will have a jumble of mags at the end of the time. If your magazines aren't marked, sooner or later you'll end up inadvertently swapping magazines with other shooters on the line. If theirs were bad, you just inherited a bad magazine. Lucky you. So mark your magazines. Use marking labels, paint, a permanent marking pen, whatever. I've even seen magazines that had their owner's initials scratched in the tube with an awl. Whatever works, make sure you get yours back. If you really, really must, loan out your magazines, loan them only to those you trust. If you have to hand them over to someone you can't trust, assume when they get back that they are new, and you have to test them all over again. In the end, I have to agree with Glock on excessive fussing over magazines. Ask yourself "Does it work?" If it does, then who cares about cosmetic dings, an imperceptible dimensional variance of the feed lips or a little bit of paint, etching or mud? If they work, I leave mine alone. If they don't, I get them fixed. If a particular one can't be fixed, I salvage any usable parts and ditch what's left. No dodgy magazine lying around for me, thank you very much.